Parts feeders, or vibratory parts feeders, are a critical part of an automated assembly system. Parts feeders are designed to deliver parts to your automation system and orient them exactly as needed. This step increases your production rate, while reducing your labor costs. Most parts feeders are automatic bowl feeders or linear feeders. 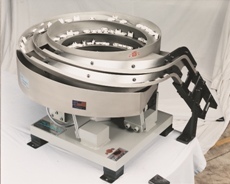 We can develop vibratory feeder bowls from 6″ to 36″ in diameter. Our feeder bowls are custom manufactured in-house out of stainless steel. Medical and food grade stainless steel is available. For further information or a free quote on parts feeders, contact Dial-X Automated Equipment, Inc.